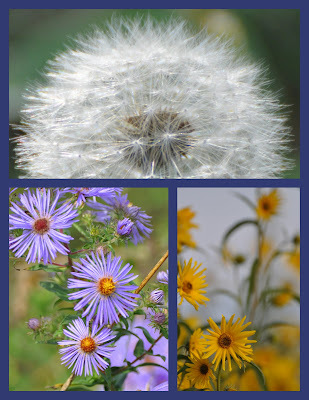 I was going to post the last sunrise of summer (Autumn arrives at 4:18pm CDT today) but Chicago has a really thick fog near the lake so Plan B is a late summer flower collage. At the top is a not-yet-ready to fall apart dandelion. So few seem to have all their feathery seeds left (the birds have been eating them as they come through). At the bottom are some bright purple and cheery yellow wildflowers from the Magic Hedge area. I think I need to purchase a wildflower identification book. I'd really like to know what I'm photographing. They look like they are from the Aster family. Great collage! I especially like the dandelion. You don't see many that perfect. Nice composition, perfect dandelion. I have already boughtmy booklet, but it's a bit more complicated than I thought. I still rely on help by friends and colleagues. I come for your amazing photography and receive a double blessing. Not only do I view amazing beauty, but receive insight: Be Open to Plan B!